This article is about 18-Volt, a character in the WarioWare series. For other uses, see Volt. 18-Volt, as he appears in WarioWare Gold. 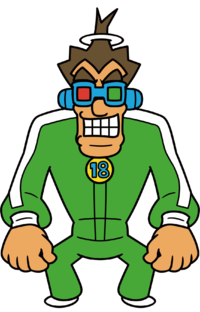 18-Volt is a major human character in the WarioWare series. He is a great friend of 9-Volt, and shares his love of video games with him. 18-Volt makes his first appearance in WarioWare: Twisted!, where he becomes a new student at Diamond City Elementary. 3.1 Website bio from WarioWare: Touched! 18-Volt and 9-Volt meet for the first time in WarioWare: Twisted! 18-Volt is the only new employee of WarioWare, Inc. introduced in WarioWare: Twisted!. On his first day at Diamond City Elementary, the teacher asks him what his hobby is, to which he responds by taking out his boom box and playing loud music. 18-Volt gets in trouble for this, and after school, he heads for his house, depressed. However, 9-Volt stops him and states that he enjoys 18-Volt's music. The two of them become fast friends and he invites him over to his house. When they get there, 18-Volt is ecstatic to see that 9-Volt has a Nintendo Entertainment System, and the duo spend a lot of time playing on the system. Eventually, 9-Volt's mother, 5-Volt, tells her son it is past his bedtime, and 18-Volt goes home. 9-Volt and 18-Volt are still playing 36-Volt Man when it gets dark. In WarioWare: Touched!, 18-Volt and 9-Volt head to the Toy Express to get a copy of the coveted, new Nintendo GameCube game, 36-Volt Man. 9-Volt snatches one and shows it happily to 18-Volt, who is carrying his boom box on his shoulder. The two friends quickly return to 9-Volt's house, curious about their new game. On their way, they pass the alien Orbulon, who is running after his flying spaceship. At the house, 18-Volt and 9-Volt play far into the night and reign victorious in the game. To celebrate their success, 9-Volt spins records again, while 18-Volt dances behind him with his boom box, but it gets so late that the two gamers fall asleep. In the morning, when they wake up, it is already 9:00 A.M. 18-Volt and 9-Volt are shocked that they are late and rush to school. 9-Volt showing his Game & Watch to 18-Volt. 18-Volt visits 9-Volt again in WarioWare: Smooth Moves. There, he shows a Game & Watch handheld console to his tall friend and plays with it. 18-Volt firstly mistakes it for a Nintendo DS Lite. He wants to see more of the console and grabs it. 9-Volt, still holding the console, informs him that he is still playing. Being impatient, 18-Volt tries to pull the Game & Watch out of 9-Volt's hands, but 9-Volt tugs on the other side of the console. This causes the Game & Watch to break into two. 9-Volt gets furious and commands 18-Volt to leave his house. 18-Volt, feeling remorseful, tries to find a new Game & Watch for 9-Volt. He first looks in Toy Express, but they do not have what he desires. After departing from the store, 18-Volt notices another store where some gamers line up. He gets into the store and the owner of the shop, Shop Manager Iwata, coincidentally has the searched Game & Watch on offer. 18-Volt reaches for it, but surprisingly, 9-Volt does the same. The friends face each other and they both excuse each other for their mistakes. 9-Volt tells 18-Volt that he wants to always be 18-Volt's P2 (Player 2), and all goes well after that. The intermission for 18-Volt's stage. In WarioWare: D.I.Y. Showcase, 18-Volt now has his own set of microgames, in which he stars in a game called Jet 18Volt, similar to 9-Volt's microgame set in WarioWare: D.I.Y.. In a bird's eye view of Diamond City, 18-Volt flies in mid-air and shoots an army of Fronks that join together to form the number of the score. His microgames share the same theme as 9-Volt's, which is Nintendo. After 9-Volt left WarioWare, Inc. to work for Diamond Software, 18-Volt, who continues working for Wario, appears to view him as a rival after his departure, as suggested by his role as a boss in his game (as well as their interaction after the boss game is completed), and his greeting to the player where he insists that he works at "twice the power as that other guy you might be thinking of". 18-Volt returns in Game & Wario once again alongside 9-Volt. He holds his own mode in Gamer. In their story, 18-Volt and 9-Volt are playing their new console, and 18-Volt bursts into tears when 9-Volt gets a score higher than his. 5-Volt takes the console and orders them to do their homework. They do so, but they get jealous when they find out she got a score higher than both. He holds a mode in Gamer. He plays microgames on the console, but unlike 9-Volt's mode, his mode is timeless and with no interruptions. 18-Volt engaging 13-Amp in a rap battle. 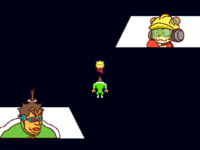 18-Volt appears once more in WarioWare Gold. As he is walking along Emerald Street, he notices a crying child on the street and asks what is wrong. The child tells him that a girl named 13-Amp stole his video games, causing 18-Volt to engage in a rap battle with 13-Amp, under the condition that the winner takes the loser's games. Eventually, 18-Volt wins back the stolen games, and tells 13-Amp to meet him at the playground of Diamond City Elementary should she want a rematch, and walks off, leaving 13-Amp shocked that she was beaten by someone in the fourth grade. 18-Volt also appears in the Potluck Gang set of the Ultra League, where he goes on a camping trip with Orbulon, 9-Volt, Ashley and Red, Dribble and Spitz, and 5-Volt. He brings vegetables to the potluck, and is then seen playing cards with the rest of the group. 18-Volt appears as a sticker in Super Smash Bros. Brawl. When equipped onto any fighter in The Subspace Emissary, it increases the power of their arm-based attacks by four points. A sticker of 18-Volt on the far edge of the table in Super Smash Bros. for Wii U. In one of the randomly generated layouts for the Gamer stage in Super Smash Bros. for Wii U, 18-Volt can be seen again as a sticker, stuck to the table. 18-Volt appears alongside 9-Volt as an Ace-class support spirit in Super Smash Bros. Ultimate. The spirit grants immunity to electric floors when equipped on a fighter. In World of Light, the spirit is located on the Base sub-map of the Light Realm. In its corresponding battle, the player has to fight Incineroar and Villager on the Gamer stage. The core obtained from the 9-Volt & 18-Volt spirit can be combined with a Labrador Retriever's core to summon DJ K.K. 's spirit. 18 Volt's appearance in the Wario... Where? set. 18-Volt makes an appearance in the Wario... Where? challenge set of Rhythm Heaven Megamix. Super Samurai Slice stars a katana-wielding 18-Volt (with 9-Volt ridding on his back) fending off assaults by demonic spirits to rescue Sal Out. 9-Volt and 18-Volt come with their own set of microgames in all games of the WarioWare series between WarioWare: Twisted! and WarioWare: D.I.Y. Showcase. For the two previous games and in WarioWare: D.I.Y., he develops his games solo. However, it is not known how much he shares in the creation of the games. For example, in WarioWare: Touched! 9-Volt says "our games", but in WarioWare: Twisted! he only speaks about "my games" in the character select menu, and 18-Volt is not even mentioned by name in the menu. The microgames are based on products of Nintendo, mainly on game software and hardware, but also on merchandise from the time before Nintendo became popular as a video game company. Microgames based on the Mario franchise are featured in every WarioWare game. In WarioWare: Twisted!, the microgame set of 9-Volt and 18-Volt is called Spintendo Classics. In this game, all their microgames are based on Nintendo Entertainment System games. While the microgames of most of the other developers involve a particular style of gameplay per developer, the microgames of them require various kinds of spin techniques. In WarioWare: Touched!, the name of 9-Volt and 18-Volt's set of microgames is Retro Action. Again, the choice of Nintendo products is much more versatile than in the prior game. Also newer products from the 21st century are featured. The microgames include a variety ways of using and also the application of the microphone, while most other microgame sets involve a particular technique again. In WarioWare: Smooth Moves, 9-Volt and 18-Volt's set of microgames involves all possible forms. Considerably more microgames are based on more recent Nintendo products. An example is Brain Age, which is based on the Nintendo DS game Brain Age: Train Your Brain in Minutes a Day! In WarioWare: D.I.Y. Showcase, 18-Volt goes solo and has created a separate set of Nintendo themed microgames, while his friend 9-Volt goes solo for the first time since WarioWare: Mega Party Game$, in WarioWare: D.I.Y. In WarioWare Gold, 18-Volt is solo in the Twist League with his set of Nintendo-themed microgames, many of which originate from WarioWare: Twisted!. Old-school Fan-boy finds a soul-mate in new classmate 18-Volt. Together, they serve up microgames inspired by classic Nintendo games. Rank C – 18-Volt is a rapper and loves Nintendo games. And that pretty much makes him the perfect friend for 9-Volt. Rank B – The shiny disc on 18-Volt's head is a CD. He wears a different one each day. On Tuesdays, anime soundtracks! Rank A – 18-Volt prefers veggies to meat and started his own garden to grow fresh carrots and tomatoes. ↑ NintendoRU. (November 22, 2018). WarioWare Gold — трейлер с персонажами 5 Вольт, 9 Вольт и 18 Вольт (Nintendo 3DS). Retrieved November 22, 2018.